When the International Organization of Standardization developed the ISO 9000 family of Standards in 1987, it aimed to improve quality management through a more systematic approach. It was developed with past methods of quality control in mind, including Total Quality Control (TQC) and Total Quality Management (TQM), but emphasized even further the importance of taking a process approach to quality management systems. The goal of ISO 9000 is to utilize a quality management system to increase productivity, reduce costs, and ensure quality of processes to safeguard the integrity of products so they meet consumer needs. The standard specifies that procedures such as deviations, audits, change control, complaint tracking and supply chain management must be documented and followed by all levels of an organization for its effective operation. 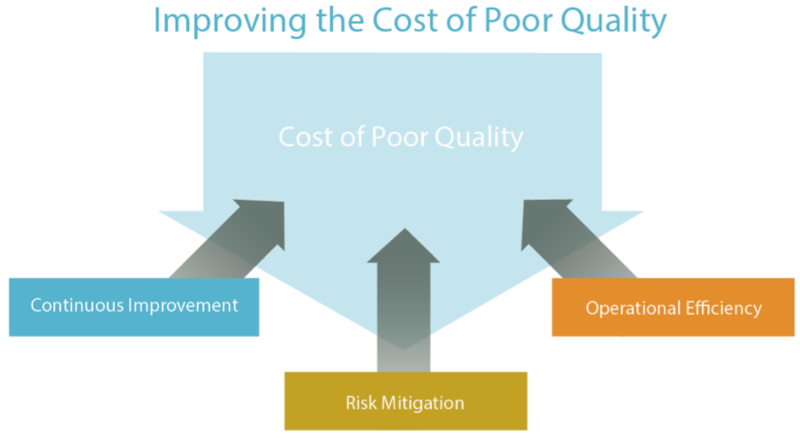 This goal is further facilitated by effective leadership, COPQ for risk management, and well organized data management. .
Over the years, the 9000 family of Standards have been revised to reflect changes in the global marketplace, but this holistic concept to quality management has remained the cornerstone of how quality management systems are judged in the 21st Century. In order for an organization to be able to achieve compliance with them, it needs a software solution that encourages holism on the enterprise level, which is why we developed TrackWise, an Enterprise Quality Management Software solution..
TrackWise is used by organizations in highly regulated industries that continue to face pressure to maintain the highest level of quality control in every facet of their operations. Some companies may be experiencing compliance issues, lack of transparency, increased costs or quality control problems. Others may be more forward thinking and implement TrackWise to be at the forefront of their industry. Does TrackWise Integrate with Other Enterprise Software Systems? Yes, TrackWise is highly configurable to meet the needs of your particular industry without painful integration complexities. Especially with today’s economic environment, with an increased number of mergers and acquisitions in many industries, a complex solutions landscape is becoming the norm. TrackWise EQMS allows for real-time interaction with enterprise software systems including Enterprise Resource Planning (ERP), Customer Relationship Management (CRM), Laboratory Information Management Systems (LIMS) and Manufacturing Execution Systems (MES). In addition, TrackWise offers the flexibility and configurability to adapt to company-specific business processes enabling organizations across a range of industries to define, track, manage and report on the core activities and processes vital to their success. How Does TrackWise Help Organizations Comply with ISO 9001:2008 Regulations? TrackWise integrates quality processes, automates workflows, and ensures consistency and improvement of all quality functions within an organization. TrackWise allows companies to manage complicated business processes throughout the product lifecycle – from supply chain management manufacturing to customer service – while mitigating risk, controlling costs and gaining greater efficiency. How Does TrackWise Support Compliance with Other Regulations and Requirements That Are Specific to My Industry? Just as the ISO 9000 family of Standards was revised to apply to a number of different industries, TrackWise is highly configurable to meet individual needs. Customers in the pharmaceutical, medical device, consumer products, electronics, and other high-tech industries have chosen TrackWise to help them ensure the quality of their products and services and comply with unique challenges, regulatory requirements, and business objectives. TrackWise experts work with companies to address all aspects of system implementation and maintenance, including business requirements analysis, configuration, prototyping, testing, validation, training, go-live and ongoing support. As needs change and different regulations are introduced, the TrackWise system will continue to evolve to meet companies’ new requirements. Click here to learn more about TrackWise.